Timothy Bouldry photographs, explores and educates people about open dumpsite activity and the communities living from them. He works with activists, scientists, environmentalists and humanitarians to help create cases for governmental powers to understand the changes these places need. 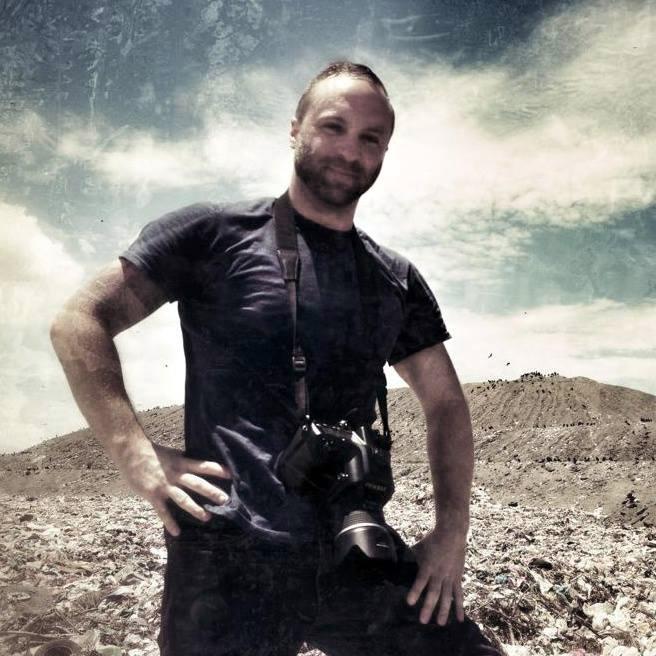 He currently resides in Nicaragua where he is photographing and running scholarship programs for kids living at these dumpsites. AWARD @ Moscow International Photography Awards, Bronze 2018. FUNDRAISING AUCTION @ NVRD: Jaarcongres (Waste Congress) at the Undercurrent, Papaverweg 265 (1,164.24 mi) Amsterdam, Netherlands. May 31st 2018. EXHBIT @ NVRD: Jaarcongres. Jaarcongres (Waste Congress) at the Undercurrent, Papaverweg 265 (1,164.24 mi) Amsterdam, Netherlands. May 30th - 31st, 2018. SPEAKER @ NVRD: Jaarcongres. Jaarcongres (Waste Congress) at the Undercurrent, Papaverweg 265 (1,164.24 mi) Amsterdam, Netherlands. May 30th - 31st, 2018. AWARD @ Sardinia Waste to Photo contest in Italy, First Prize 2017. WEBINAR @ Latino América Recicla. December 12th, 2017. EXHIBIT @ ISEP: Instituto Superior de Engenharia do Porto. November 21st - 23rd, 2017. SPEAKER @ Jornadas Técnicas Internacionais de Resíduos, Porto, Portugal. November 21st - 23rd, 2017. SPEAKER @ ISWA World Congress and SWANA’s Wastecon, Baltimore Convention Center. September 27th, 2017. EXHIBIT @ “Dumpsite Stories” ISWA World Congress and SWANA’s Wastecon, Baltimore Convention Center. Sept 24th - Sept 27th, 2017. EXHIBIT @ “Dumpsite Stories” 180 9 avenue and 21st Street, New York City. September 20th - 23rd, 2017. FUNDRAISING AUCTION @ ISWA World Congress and SWANA’s Wastecon, Oriole Park at Camden Yards, Baltimore, Maryland, USA. September 26th, 2017. PRESS @ Avfall Ochmiljö. #2/2017. SPEAKER @ Seminario International 22 to 23rd 2017 Universidad Nacional Experimental del Táchira, Venezuela. March 23rd, 2017. SPEAKER @ ISWA’s World Congress, Master Hall of Master Congress Center, Novi Sad, Serbia. September 19th, 2016. Exhibit @ Photoville’s The Fence “Calling a Landfill Home” at Atlanta BeltLine’s Eastside Trail. 2016. Exhibit @ Photoville’s The Fence “Calling a Landfill Home” at Brooklyn Bridge Park. 2016. Exhibit @ Photoville’s The Fence “Calling a Landfill Home” at The Houston Center for Photography. December 6th - March 31st, 2016. PRESS @ Zoë Lenkiewicz: “Valuing Waste, Valuing Those Who Depend On Waste.” January 24th 2016. DIRECTER + CREATOR @ The ISWA Scholarship Programme in Nicaragua serving two dumpsite communities. EXHIBIT @ “La Verdad Sin Cortina” at Centro Cultural PAC Managua, Nicaragua. December 3 -11th 2015. SPEAKER @ ISWA’s World Congress, Antwerp City Theatre, Antwerp, Belgium. September 8th, 2015. EXHIBIT AND FUNDRAISER @ 20th ACRIA Annual Holiday Auction at Cunard Building, 25 Broadway in Lower Manhattan’s Financial District, New York City. December 11th, 2015. PRESS @ La Prensa: “La Verdad Sin Cortina” Managua, Nicaragua. December 1st, 2015. PRESS @ CNN: “Living Inside a Landfill.” April 14th 2015. PRESS @ Metro. January - February 2015. PRESS @ Americas Quarterly: “El Note at Cambalache: Life at a Landfill.” February 13th, 2015. EXHIBIT @ “A Landfill Life” at Marran Gallery Lesley University 29 Everett Street, Cambridge, MA. January 19th - February 22, 2015. EXHIBIT AND FUNDRAISER @ 19th ACRIA Annual Holiday Auction. Skylight Modern, 537 West 27th Street, New York City. December 11th, 2014. PRESENTATION @ Rutgers University, New Jersey. Wednesday, September 12, 2014. PRESS @ Social Documentary Network: “A Changing Chureca.” August,2014. EXHIBIT AND FUNDRAISER @ “Wasteland into Homeland Campaign” at the Mercedes Club, 550 West 54th, New York City. May 10th, 2014. PRESS @ NACLA: Report on the Americas. Winter, 2013. EXHIBIT AND FUNDRAISER @ 18th ACRIA Annual Holiday Auction at Stephen Weiss Studio, 711 Greenwich Street, New York City. December 12th, 2013. PRESS @ Forward Thinking Museum: “A Changing Chureca.” 2013. PRESS @ Aspect/Ratio: “A Changing Chureca.” 2013. PRESS @ Americas Quarterly: “La Chureca: Calling a Landfill Home.” October 31st, 2013. TV INTERVIEW @ Channel 8 in Nicaragua, September 3rd, 2013. FILM SCREENING FUNDRAISER @ The Shrine, 2271 Adam Clayton Powell Jr Blvd Harlem, New York City. May 2nd, 2013. EXHIBIT @ The US Environmental Protection Agency’s Methane Expo March12-15th, 2013. EXHIBIT @ The 3rd Annual Night of the Arts at The Center, Gallery 410 208 West 13th Street, New York City. November 7th, 2012. EXHIBIT @ Monmouth Museum, 765 Newman Springs Road, Lincroft, NJ. Sept 14th-Oct 28th, 2012. EXHIBIT AND ARTIST TALK @ SBM Art Gallery, 320 w37th St. Suite 704 New York City. June 28th, 2012. TV INTERVIEW @ Channel 2 in Nicaragua. March 2, 2012. TV INTERVIEW @ Channel 8 in Nicaragua. Feb 29, 2012. EXHIBIT @ 45 Rockefeller Center, New York City. Jan 17th - March 19th, 2012. EXHIBIT @ World Bank, 1818 H Street, NW, Washington, D.C. for The World Bank's Law, Justice and Development Week Conference. November 14th 2011. EXHIBIT AND CEREMONY @ House of Sweden. 2900 K Street NW, Washington, D.C. (Embassy of Sweden) November 11th, 2011. EXHIBIT @ Foto Week Washington DC, Pepco Edison Place Gallery, 702 8th Street NW, Washington, D.C. November12th, 2011. EXHIBIT FUNDRAISER @ The Center 208 w13th Street. November 4th, 2011. EXHIBIT @ Colors of Life Exhibition Tour; Lynn University in Boca Raton, Florida for Final Presidential Debate. October, 2011. EXHIBIT @ Colors of Life Exhibition Tour; Muhammad Ali Museum, Louisville, KY for the Vice-Presidential debate. September, 2011. EXHIBIT @ Colors of Life Exhibition Tour; Hofstra University, Long Island, New York for Presidential Political Debate. August, 2011. EXHIBIT @ Colors of Life Exhibition Tour; Miami’s Children’s Museum. July, 2011. EXHIBIT @ Colors of Life Exhibition Tour; June Fitzpatrick Gallery, Portland, Maine. June, 2011. EXHIBIT @ Colors of Life Exhibition Tour; Denver Children's Hospital, 1830 Franklin Street Denver, CO. April 9th - 23th, 2011. EXHIBIT @ Colors of Life Exhibition Tour; Colorado State Capitol - Denver 200 East Colfax Avenue Denver, CO. April 2nd - 6th, 2011. EXHIBIT @ Colors of Life Exhibition Tour; Texas State Capitol-Austin 1100 Congress Ave (11th Street) Austin,TX South Gallery. April 23rd - 30th, 2011. EXHIBIT @ Colors of Life Exhibition Tour; NorthPark Mall, North Central Expressway, Suite 1030 Dallas, TX. April 9th - 22nd, 2011. EXHIBIT @ Colors of Life Exhibition Tour; The Convention Center, 1555 Palm Beach Lakes Blvd. April, 2011. EXHIBIT @ Colors of Life Exhibition Tour; The Children's Home Society, 3333 Forest Hill Blvd. March, 2011. EXHIBIT @ Colors of Life Exhibition Tour; The Schoolhouse Museum, 129 East Ocean Ave, Boynton Beach. February, 2011. EXHIBIT @ Colors of Life Exhibition Tour; Dr. Joel and Barbara Alpert, 152 Orchid Cay Drive, Palm Beach Gardens. January, 2011. EXHIBIT FUNDRAISER @ The Center 208 w13th Street November 3rd, 2010.